Jheck Dionela (Cagayan Valley), Arriane Argarin (Cignal HD) and Jen Reyes (Cignal HD). 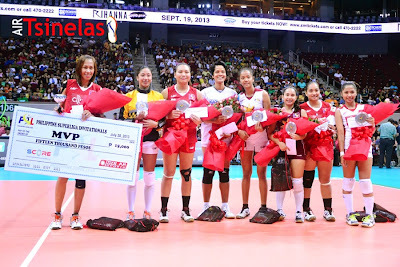 Former UST Tigress Venus Bernal of Cignal HD received the PSL Invitiational Most Valuable Player honors. The veteran spiker is one of the reasons why Cignal HD earned their spot in the Philippine Super Liga title match. Her tenacity, leadership and never-say-die attitude was a no brainer for the MVP plum.